The time has come guys to show you one of the greatest fighting games of all time for Android. And this game is called TEKKEN published by NAMCO. I am very excited that this game, at last, is on the phone in your hands. 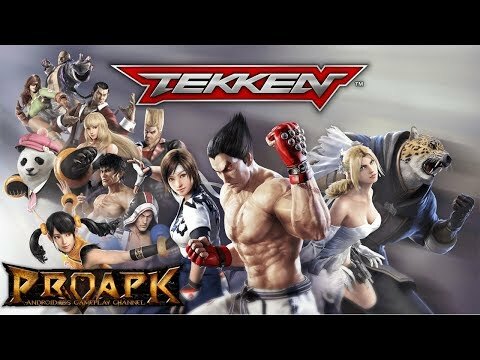 I am a Tekken fan since a little kid when the first games came out on PS1 and this game was a revolution. Let`s talk about the game. Almost all of its characters are locked when you begin. Yep, this is a fighting game that starts with only one selectable character. You will have to grind your way to unlocking each and every other character you wish to use. But that’s not all. You also have to grind to unlock their skills, their equipment, and their special moves. All at the behest of the RNG gods. So of course, the fact that all of these separate items will also need to be micromanaged individually for each character you use just goes to show how ridiculous the core design of this game is. And the best part is you will need at least 3 different characters to be properly set up in order to be competitive thanks to how most battles require a team of 3. Talk about a needless time sink. So we are in the gameplay section. Let`s go deeper and see what we have here. Once you are in a fight, the first irritation designed to push you towards spending your money on the game’s many loot boxes and in-game currencies is the fact that your characters do not heal after a fight is finished. Your team will inevitably have their health whittled down with each successive battle. In the Story Mode, this issue is made even worse, as you have to plow through quite a few fights in a row to finish each chapter. In between rounds you have the option to use healing and revival potions, which can, of course, be purchased with the game’s in-game currency of gems, that can be conveniently purchased with real money through IAPs. The cherry on top is that your character’s health will not replenish after you finish a chapter either. This means you are always on the hook for the health of every single fighter you use, every time you use them. And with how poorly the game is balanced, you can bet you will be spending quite a bit of time dealing with the constant healing and revival of your fighters. As I said I am a fan of this game and I like it. You should try for yourself.